Spice Box with Cloves SB-4 CAT# SB - 4. 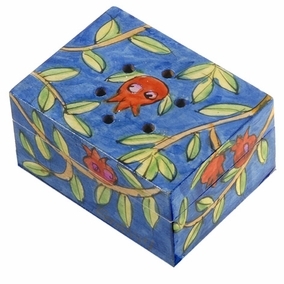 Spice box with cloves. Size: 2" X 1.6" X 1". .The text of Havdalah contains an introductory paragraph, followed by four blessings; a blessing on the wine, on the spices, on the candle and on the separation between the holy and the mundane. See List of Jewish prayers and blessings: Havdalah. The Ashkenazic version of the text of the introductory paragraph made up of Bible verses (used by both Ashkenazic and Hasidic Jews) which come from Psalms, the Book of Isaiah and the Book of Esther. Most chassidim and those following the Sefard prayer rite recite the Yiddish prayer Gott fun Avrohom. The introduction to the Sefardic version is slightly different. The order of elements when havdala is combined with kiddush (e.g., on a Saturday night that is Yom Tov) is known by the acrostic Yaknhaz. This is the initial letters of Yayin (wine), Kiddush (blessing the day), Ner (candle), Havdala (the havdala blessing) and Zman (time, ie shehechiyanu).